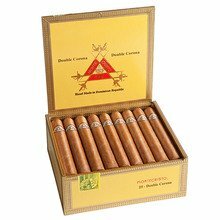 The famous Montecristo Double Corona is a beautifully rolled and firmly packed cigar that is loaded with rich smooth and creamy flavors and a delightfully sweet aroma. 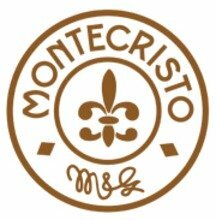 The Montecristo cigar maintains its reputation as one of the finest cigars on the market and the standard by which other cigars are judged. 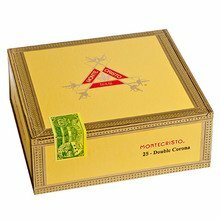 The Double Corona is packaged with 25 cigars in the classic yellow Montecristo dress box. Smoked one yesterday I love Monte no issues 1 relight though but that's rare for sure. .
One of my top 3. Might be my favorite cigar. Always reliable and delicious. I know everyone has their preference of humidity, but I find them best if smoked on the wet side instead of the dryer side. The Montecristo brand is top notch and double corona is a great size if you like size. These are excellent nine hole cigars. A nice get to give to your buddies. This is a great smoke. Not strong, very smooth. A joy to smoke when I'm taking it easy. No reason I can think of not to have these around in as large a quantity as the wallet permits. Nice cigar. Draws a bit stiff. Received too dry, so it unravels when smoked. I have smoked double Corona for 14 years. My last 2 boxes have not owned up to its classic form. The ring size has been 48 some even less in half the box,with a tight draw.This altered the pleasure greatly. A dense, creamy smooth mild to medium bodied, relaxing stick. Sweetly aromatic with very good build, burn & draw. This is probably absolute favorite cigar to smoke . It has a great draw. Great flavor. There is literally nothing wrong with the cigar. Classic flavors with Flowers construction. My friend is a huge Montecristo fan, he drew me in years ago and I haven’t been able to get out! They embody everything that a good cigar should. Good smoke, a vey light flavor, but satisfying smoke. The size is just right for a shorter, but enjoyable stick.